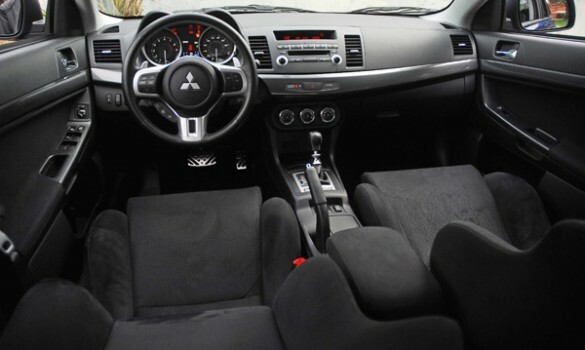 The all-new Limited Edition 2011 Mitsubishi Lancer Evolution SE (Special Edition) combines the best of the GSR and MR while saving you more than $3,000.00 off the price for a comparable MR model. The all-new SE slots nicely between the GSR and MR, and like the new MR, loses the high rear wing in favor of a more discreet rear lip spoiler for downforce enhancement. The all-new EVO SE features the signature EVO MR ‘shark nose’ front fascia, HID headlamps, foglamps, large side airdams, aggressively styled sloping aluminum hood with air scoop and heat extractors, side fenders with heat extractors, deep lower side extensions, boxed fenders, a working rear air diffuser with dual, 4in. wide polished aluminum exhaust tips, and special SE badging on the lower right trunk panel. SE is a new, high-contrast multi-color LCD cluster, and a leather-wrapped parking brake with chrome button. One other difference between the MR and SE is that the SE is shod with Enkei light alloy 18X8.5in. multi-spoke wheels instead of the MR’s BBS light alloy 18X8.5in. multi-spoke wheels, but both ride on sticky 245/40R18in. Yokohama Advan high-performance, low-profile tires. New for all 2011 Mitsubishi Lancer Evolutions this year is Mitsubishi’s FUSE hand’s-free link system that gives users the ability to access their Bluetooth-enabled cell phone, iPod or USB drive with the sound of their voice; Real-Time Traffic is a very convenient and informative real-time traffic function that has been added to the optional 40GB HDD navigation system; the Lancer Evolution’s dual exhaust system has been re-tuned for an even more sporty-sounding exhaust note; new low profile rear spoilers for the SE and MR with the GSR coming with the large rear spoiler as standard; every Lancer Evolution features a convenient USB port that is easily accessed inside the storage bin. With its rally racing-inspired design, electronic driver aids and potent turbocharged power, the Mitsubishi Lancer Evolution is one of the most capable high-performance sports sedans in the world today. 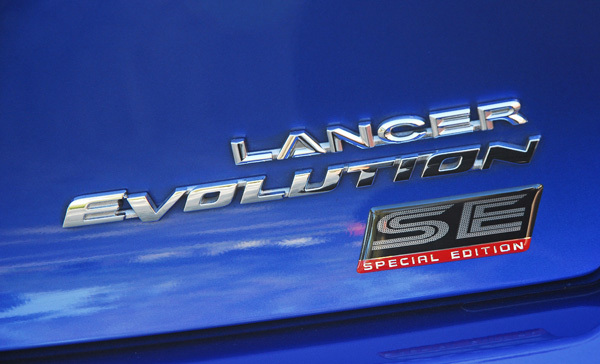 The all-new 2011 Lancer Evolution SE doesn’t lose any of the MR’s high-performance magic under the skin. The heart of the SE is the 4B11 T/C engine that gets the pulse pumping hard of even the most jaded enthusiast. This 2.0 liter, DOHC 16-valve four-banger consists of an all-aluminum engine block and cylinder head and a bore and stroke that both measure exactly 86.0mm (3.4in. ), making it a ‘square’ design as it bore-stroke ratio is 1.0. Power ratings for this potent engine are 291hp at 6,500rpm and 300lb.ft. of torque at a much lower 4,000rpm. 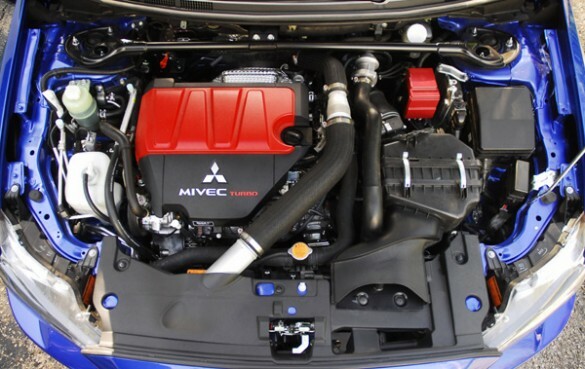 the Mitsubishi Innovative Valve timing Electronic Control system (MIVEC) works on both the intake and exhaust camshafts for optimized power production and cleaner exhaust emissions. This twin-scroll turbocharged and intercooled engine’s compression ratio is set at 9.0:1. 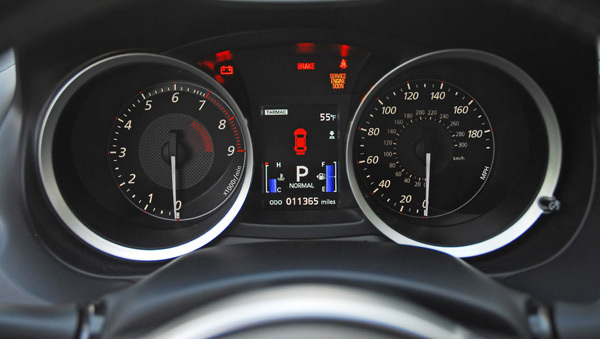 The engine revs so quickly and effortlessly to it high 7,000rpm redline that it is scary fun watching the white tachometer needle quickly go up then quickly go down as you hold on for dear life. 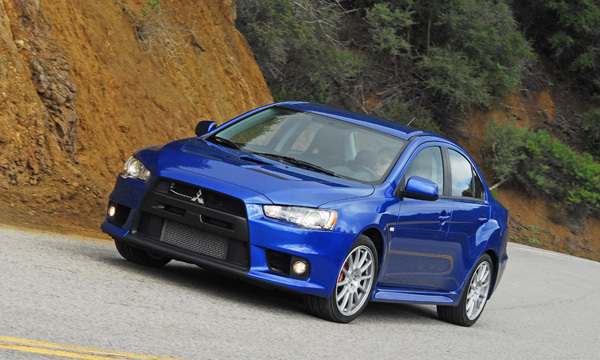 Hard–core driving enthusiasts will really enjoy the high-tech transmission found standard in the new EVO SE. Mitsubishi’s revolutionary Twin Clutch Sportronic Shift Transmission (TC-SST) is nothing short of an engineering marvel. The TC-SST allows you to perform shifts in a fraction of the time it would take to change gears manually. The system also allows you to make these shifts via the console-mounted baseball shaped and stitched console-mounted shift lever, or even faster with the more conveniently located magnesium steering wheel paddle shifters. For just cruising this close-ratio six-speed Twin-Clutch Sportronic Shift Transmission can operate in a fully automated mode, just like the typical automatic transmission. In either manual or automatic mode, each up or down shift takes place instantaneously with no perceptible lag time, with the engine management system ‘blipping’ the throttle with every downshift, matching the engine and transmission speeds perfectly. I still can’t believe how quick the shifts take place and when attacking a steep curve, how quickly the downshift takes place with a perfect match to the higher rpm’s. 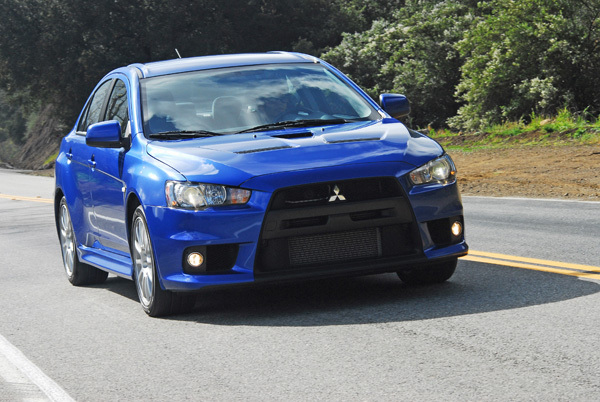 Mitsubishi’s Lancer Evolution has always been known for its exceptional handling prowess, but the advanced electronic driver aids on the current generation vehicle-especially the company’s superb Super All-Wheel Control (S-AWC) system-have taken the EVO’s road hugging maneuverability to an astonishingly high-level, just like a real rally racecar. Super All-Wheel Control is not one specific device but a network of technologically-advanced dynamic systems that constantly communicate with each other to provide optimized tractability. These include Active Stability Control (ASC), and Active Center Differential (ACD), an Active Yaw Control (AYC) rear differential, and Sport ABS brakes. Working in concert, Super All-Wheel Control (S-AWC) modulates torque delivery to each wheel in real-time for maximum control. 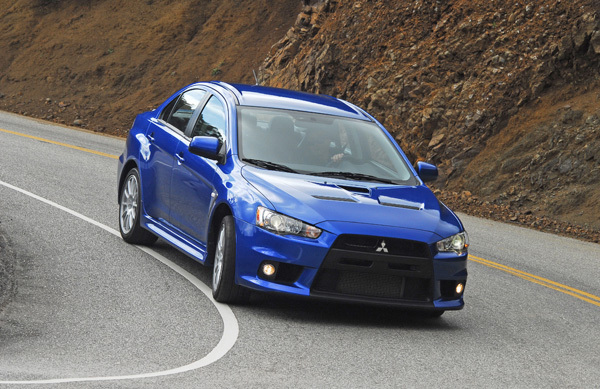 The Active Stability Control (ASC) includes the EVO’s vehicle traction control and stability control systems and helps to regulate brake force and engine power distribution at each individual wheel. The Active Center Differential (ACD) uses an electronically-controlled hydraulic multi-plate clutch to split torque (up to 50:50) between the front and rear wheels. This routing of engine power between the front and rear of the vehicle is determined by data collected from a variety of sensors including individual wheel speeds; throttle opening, steering wheel angle, and the vehicle’s lateral and longitudinal positioning. Acting in a similar fashion to a conventional limited-slip differential, the Active Yaw Control (AYC) rear differential utilizes a planetary rear differential, yaw rate sensor and brake force control via the Active Stability Control (ASC) system to control rear wheel torque for improved traction and stability in slippery road conditions and high-speed driving. 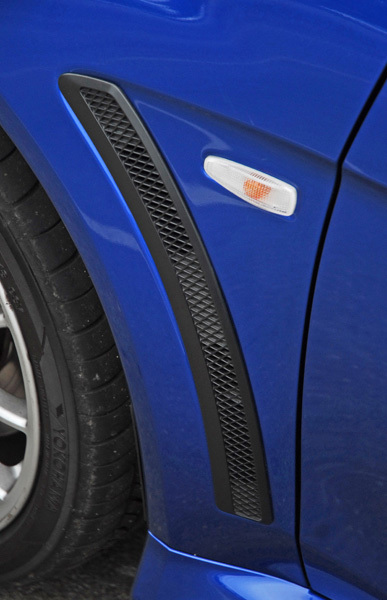 Also, thanks to advanced brake pressure and yaw rate sensors, the Sport ABS system helps you to maintain better steering control on slippery surfaces or under very heavy braking. The S-AWC system is amazing to drive with. I felt so confident in any driving situation and how well the system kept me on track with amazing grip during my many drives on different types of road surfaces and different speeds. The all-wheel drive has two shift-gate mounted settings-comfort and sport, that gives you a choice for a more comfortable ride when you are just cruising and relaxing, or tightens up the gear changes for razor-sharp reaction to your throttle inputs. They have it nailed down perfectly! 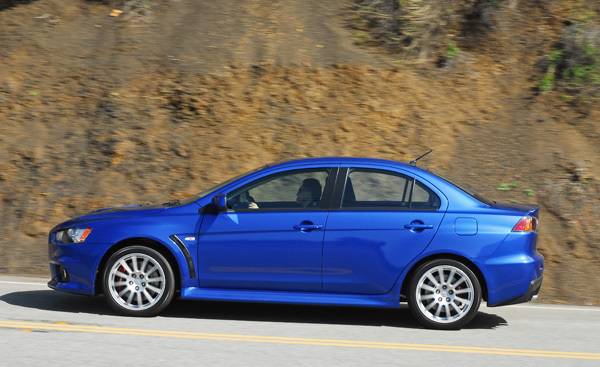 A highly rigid structure, strong but lightweight components and a superbly-tuned independent suspension system make up the foundation of every Lancer EVO. The EVO’s platform features ample use of ultra-strong yet lightweight high-tensile steel along with a hood, greenhouse and front fenders composed entirely of lightweight aluminum. Mitsubishi engineers cleverly placed the car’s battery and windshield washer fluid reservoir in the trunk to help improve its ideal vehicle weight distribution of 57.4/42.6% front to rear giving the EVO SE a more neutral and nimble feel on the road. Like the MR, the SE’s suspension consists of a MacPherson type strut (inverted strut) design up front with race-bred Eibach coil springs that lower the car slightly, Bilstein mono-tube gas-charged shocks and a 25mm stabilizer bar keeping front body lean to a minimum. The rear multi-link setup includes the same Eibach coil springs, Bilstein mono-tube gas-charged shocks and a 23mm stabilizer bar. To improve unsprung weight, the control arms for both the front and rear suspensions are constructed of forged aluminum. Quickly and safely slowing the EVO SE down from speed are the same incredible brake package found in the MR. Up front are 13.8in. 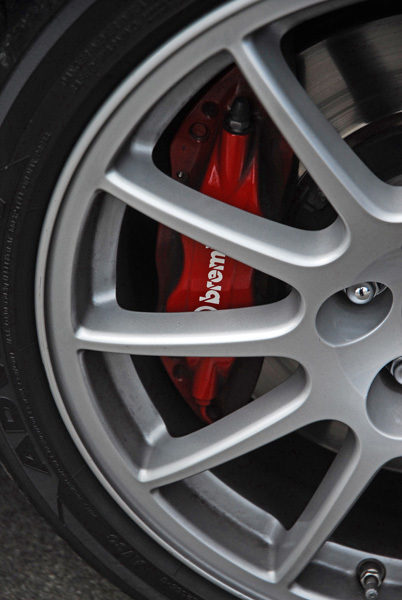 vented rotors clamped with light-weight, 2-piece, four-piston Brembo calipers, while the rear features 13in. vented rotors clamped with Brembo two-piston calipers. 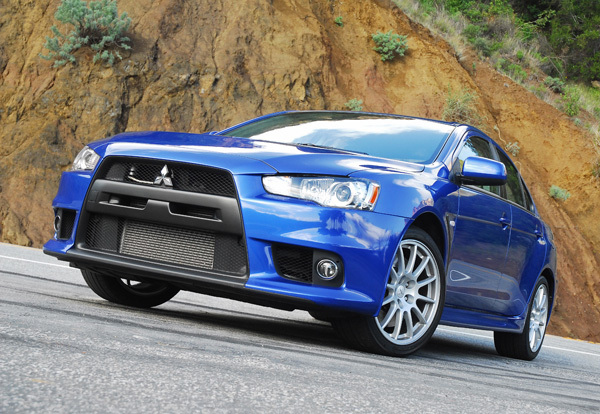 The incredible braking ability of the EVO SE is enhanced with 4-channel Sport ABS with EBD. This setup is race-track-ready for head-to-head competition, or when challenging sharp curving roads in the mountains or on the back roads. Having made its mark on the world in motorsports competition including multiple championships in the grueling World Rally Championship (WRC) where combatants battle it out on courses that include sand, gravel and paved roads, the all-new EVO SE’s suspension is stiff but never harsh and is a delightful vehicle to live with on a daily basis thanks to its excellent ergonomics and thoughtful amenities. 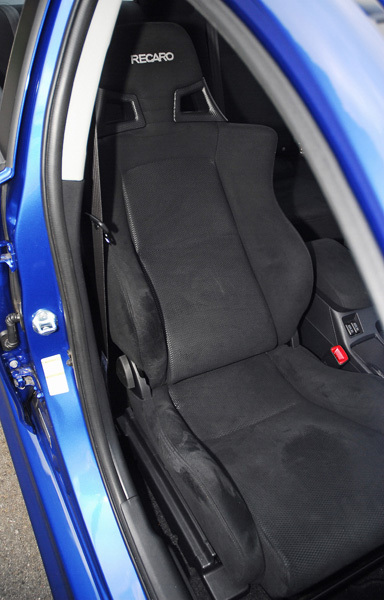 The comfortable and supportive Recaro bucket seats work well for either quick trips or long daily commutes, while a sumptuous-sounding six-speaker 140-watt AM-FM-CD/MP3 audio system wit digital processor, automatic climate control wit micron filter, sporty leather wrapped/tilting steering wheel with cruise control/audio buttons, remote keyless entry, aluminum faced pedals, power windows, variable intermittent wipers/washers, power side windows, power door locks, dual front cupholders, storage slot, storage bin under a padded top, dual visor with vanity mirrors, rear pull-down armrest with dual cupholders, front-door storage slots, dual map lights, grab handles atop each door, 12-volt accessory outlet, thick cut-pile carpeting and signature front/rear floor mats. All controls, levers, switches and buttons are within easy reach and illuminated for safe nighttime driving and helps make extended time behind the wheel very pleasurable. 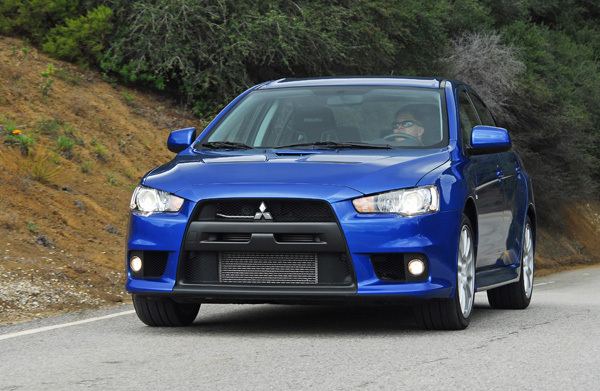 The new 2011 EVO SE features numerous innovative safety technologies to help protect you and your passengers. 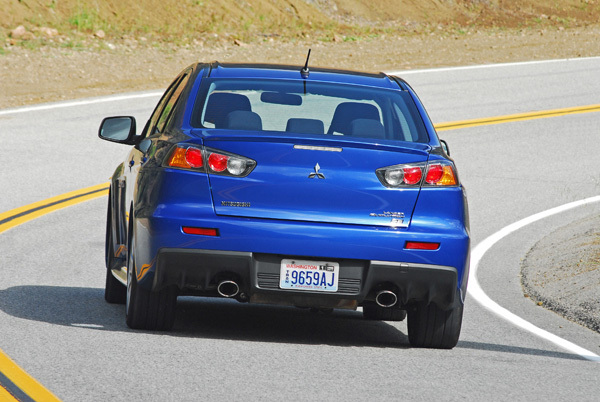 It is endowed with Mitsubishi’s next-generation Reinforced Impact Safety Evolution (RISE) unibody platform that, in the event of a side or rear collision helps to dissipate energy away from the vehicle’s occupants to improve protection from injury: the RISE system also helps to protect the fuel system from rear impacts. 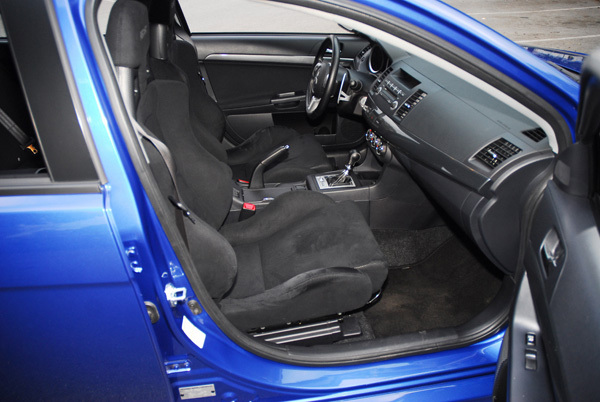 Seven airbags are also included: an advanced dual front airbag supplemental restraint system with occupant sensors, front seat-mounted side-impact airbags, side curtain airbags and a driver’s-side knee airbag, tire pressure monitoring system, 3-point safety belts for all five occupants with load limiters/pretensioners up front, LATCH system for child seats, daytime running lamps, engine immobilizer and car alarm. 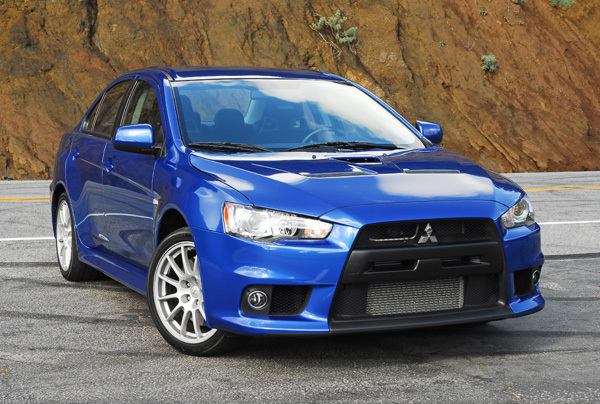 With a price of only $35,790.00 the all-new EVO SE is simply fantastic, awesome and incredible. 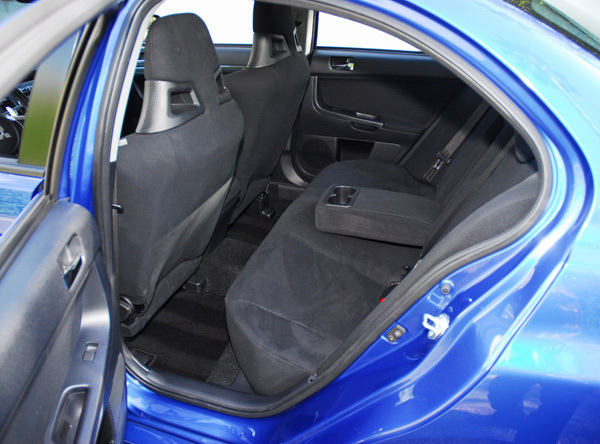 You can’t get any other super-high-performing four-door sedan for a better price.